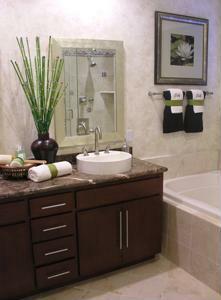 Now that 2012 is finally here, you may be ready to get started on myriad household projects, but your tired old bathroom should be the first to get a face lift. Green improvements are a popular trend in the world of interior design, and they can help improve your home's efficiency and drag your space into the modern era. Lighting can be a huge drain on your finances, so consider using a few LED fixtures instead of overhead incandescents. Use a light bar above your bathroom vanity to eliminate one source of energy-wasting old style bulbs and improve the atmosphere of the space overall. If you have a window in your bathroom, consider installing cell shades to form a tighter seal and prevent air leakage. These window coverings come in countless colors and styles, so you can find the perfect match for your interior design scheme. These bathroom accessories are simple additions that can improve the energy-efficiency of your space and offer a contemporary flair. What green improvements work best in your bathroom?